"Every month, I will select a particular painting by Peter and will tell a story of the background of that particular painting, and how it came to be executed. I hope this will give another insight into the artistic journey of my husband, Peter Robson"
This charming Winter scene depicts a couple in a sleigh coming down what is now Quaker Road towards the heart of the village of Sparta. It has just passed the Vary House, a very important part of Sparta's history. It was in this house in 1834 where a town meeting was held and the decision was made to change the name of the village from 'Corners' to 'Sparta'. At the time there seemed to have been a trend to giving towns and villages classical names. It is said that 'Aylmer' came very close to being called 'Troy'. It is the Christmas season with the wreath on the front door and perhaps the couple are heading to a friend's house for Christmas dinner. Peter was commissioned to execute a painting celebrating the Formation of the 125th Elgin Regiment - 1866-1991. When the painting was completed, limited edition prints were produced and signed by the Honorary Colonel, The Earl of Elgin & Kincardine, the Honorary Lieutenant-Colonel, R.S. Chamberlain, the Commanding Officer, W.P.J. Thomas, and Peter Robson. The painting was unveiled at a formal dinner attended by Lord Elgin and the prints were a huge success. Subsequently, Peter and I took an Artist Proof and presented it to the Queen's Own Fusiliers at the Tower of London, in London, England. The original painting was on display at Peter's Retrospective Art Show at the St. Thomas Public Art Centre in 2017. The signing of the prints in Peter's studio. It was the painting that we selected to be the first limited edition to be introduced after Peter passed away. It was also the one that we selected for the poster to announce Peter's retrospective art show at the St. Thomas Public Art Centre from May 13th to July 1st, 2017. It beautifully highlights Peter's ability to capture the simple beauty of a moonlit landscape with a solitary silouetted tree. "When I hear Beethoven's 'Moonlight Sonata', it seems a perfect accompanyment for this lovely painting." In 1990, when Peter created the concept of 'Story Time Bear', he always knew that the centre double page illustration was to be of a hockey game. This painting features some of the characters contained in the newly published book such as Take Time Turtle (timing the game), Hurry Up Hare (playing forward), Freddy the Mouse, Story Time Bear himself as the coach, and, of, course, Ellie the Clown. However, there are additional characters which Peter planned to use in subsequent books. For example, there is George the Giraffe's cousin 'Long Spots', 'Ribbits' the frog, 'Wiles' the Fox, 'Masker' the Racoon, and 'Porterhouse' the Pig and some of Freddy the Mouse's relatives. Who knows what adventures they would have had? I chose this particular painting for this month's Studio Chat because it relates to our 35% anniversary in a special way. It was the very first watercolour painting that Peter sold from his original studio (located in the West end of the Tearoom). It is a charming impression of this little bird's surroundings with its warm colours and close-up viewpoint. ​ AVAILABLE IN AN OPEN EDITION PRINT- FRAMED SIZE 20" X 16" APPROX. The retail price is $125.00 and with the anniversary discount, the framed price is $81.25. Peter was evacuated from London, England with his little sister, Betsy, during World War 11 because of the heavy bombing that occurred on a nightly basis and his parents decided that to be evacuated to the West Country of England was a safe choice for their children. After the war, the family moved to Margate, where Peter would spend what he considered a very special childhood. He grew to love the sea and the idea of adventures to be experienced just over the horizon. Tom Peppermint was the name of a fisherman who shared his skills with the young boy who was so thirsty for knowledge. 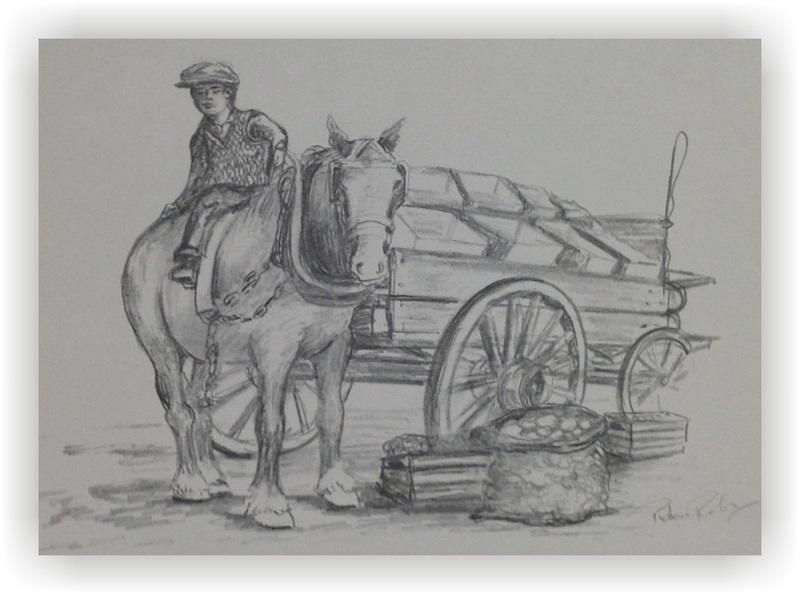 Peter had the job of leading Mr. Foat's horse, Peggy, around the streets of Margate delivering produce, lifting up the weight so that the horse could move forward and lowering it to the ground so that Mr. Foat could carry the groceries to the individual houses. As a special treat he was allowed to sit on top of the huge horse's back. recollections of these childhood memories. I have tried to encapsulate Peter's thoughts and intentions when he envisioned 'The Three Ages of Man', as they meant a lot to him, both technically and emotionally. 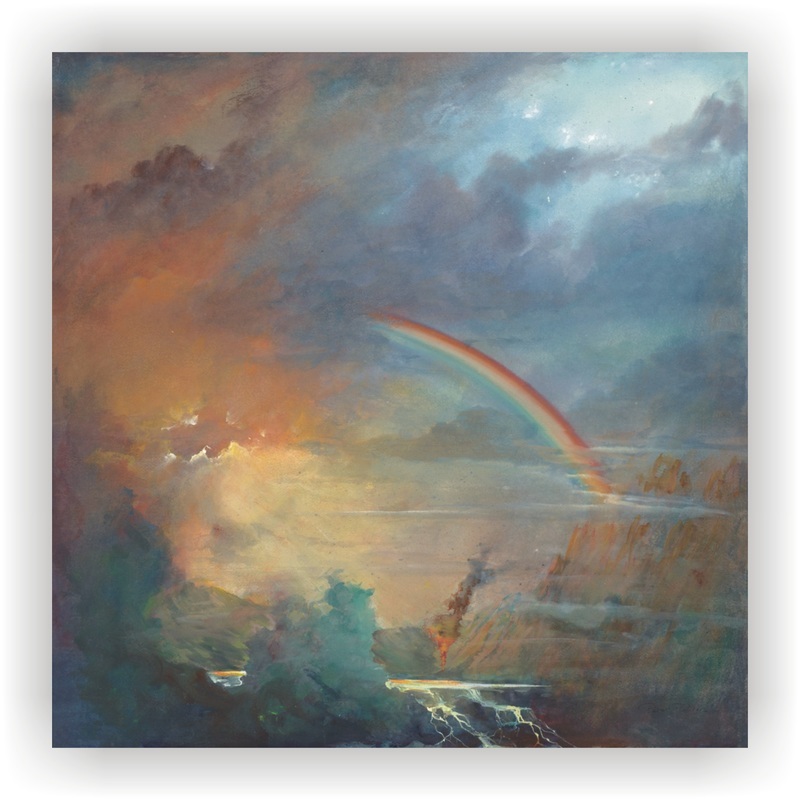 It was John Peowrie, a writer and life-long friend of Peter, who wrote Image Form and Colour and various articles about Peter throughout his career, who suggested that Peter digress from his realistic landscapes and allow his mind to take a journey with only colour as its genesis. After much deliberating about the concept, Peter commenced painting this tryptich with great enthusiasm, mostly in the middle of the night as silence was necessary for complete concentration. Peter loved to discuss these pieces with interested collectors and enjoyed listening to their personal interpretation of the paintings as they held a special place in his heart. 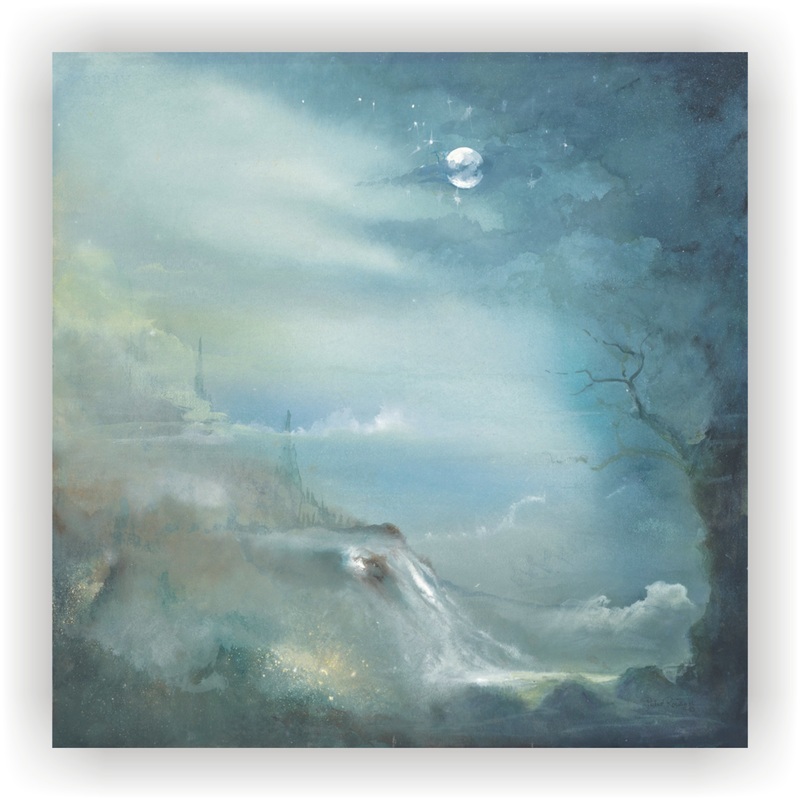 I decided to reproduce this collection of paintings in giclee form in an extremely low edition of 13 sets in exactly the same size as the originals to guarantee that the mood and mystical qualities of the original paintings would be evident. the TITANIC on its maiden and, sadly, only voyage as it leaves Cherbourg harbour. It was painted on a canvas of close to six feet in order to capture every intricate detail of this iconic ship. Many Titanic enthusiasts have examined the painting at length and are impressed by its authenticity. For example, Peter was aware that there were only three working funnels - the fourth, although at first glance seems to be operating, sent out only steam which mixed with the smoke from the other three and added to the impressiveness of this mighty ship. Even the number of portholes is accurate. .........but because it highlights Peter's love of pure landscape. He loved to just go outside - set up his outdoor painting box containing all of the materials he needed to create the painting in his mind - and simply paint what he saw. When he did this, he was able to capture one little moment in time on one particular day. Generations of artists have enjoyed this plein air painting method to celebrate nature's many wonders. As Eleanor was born in Scotland, she and Peter visited there many times and never failed to be awed by the power of the landscape. Peter created these two paintings, which have a decidedly romantic theme, to celebrate the rich and turbulent history of this small part of the United Kingdom. Nestling at the foot of Mount Quinag, the sparse ruins of Ardvreck castle guard a treacherous secret. Here, the Marquess of Montrose, Champion of the Scottish Royalists, was arrested and sent to Edinburgh for execution in the high street on May 21, 1650. Some believe he was betrayed by MacLeod of Assynt, who sold him to the Cromwellians for a 25,000 pound reward, but this is hotly disputed. Built on the site of an iron age fort, the present castle of Eileen Donan was constructed by Alexander 11 in 1220, as part of the region's defences against Viking attacks. It later passed into the hands of the MacKenzies of Kintail, and subsequently became linked with the Macrae clan. Spanish troops were garrisoned there during the first Jacobite uprising (1745) when the castle was severely damaged by English warships. "Golden Days" depicts Alma Collage, St. Thomas, Ont. Peter was commissioned in the early 1990's to execute a major oil painting of this most prestigious girls school. Limited editions were produced and sold to alumni all over the world to raise funds to assist the efforts in preserving the building and grounds. Alma College was built in 1878 during St. Thomas' economic boon as a liberal arts school for girls. Young ladies, both locally and internationally were educated there in the arts, literature, and music. Following its closure in 1994, the building was used by movie studios and Peter's original painting was hanging in the principal's office in the movie "Mr. Headmistress" in 1997. Ironically, on May 28, 2008, there was a petition to be passed around at the Ontario legislature to prevent the demolition of the building, and on this same day, Alma College was burned down and the ruling was arson. n the late 1990's, Peter was commissioned by the owner of Mackie's to capture the spirit and the history of this iconic lake-front restaurant located on the main beach in Port Stanley, Ont. For generations, it has provided visitors with hamburgers, hotdogs, great fries, and their famous orange beverage. It is a well-known landmark in this charming fishing village, enjoyed by tourists daily. prints for the family, and also art cards which are available at the restaurant as a souvenir and at Peter Robson Studios. Peter captured a happy carefree day being enjoyed by everyone on Port Stanley beach. A lot of the people in the painting are our family, as they were always ready and eager to go with Peter and be a part of a future painting. The bikini-clad girl standing is Peter's daughter, Virginia - her husband, David, is sitting in the chair and the four grandkids, Jeff, Allison, Madison, and Abigail are building the sandcastle in the foreground. 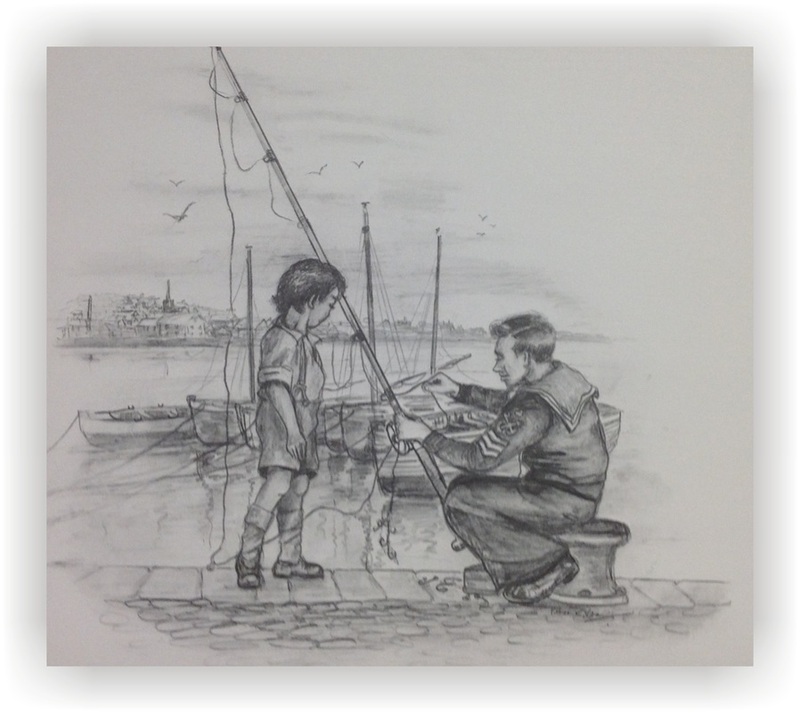 As the day wore on, Peter couldn't resist the temptation of foregoing the sketching for a little bit and jumping right in with Steve in showing the kids how a real sandcastle should be constructed! For a period of 14 years, General Motors of Canada commissioned Peter to execute a series of paintings depicting one of their classic automobiles. They chose the particular vehicle, perhaps to celebrate an anniversary of that car, or a special occasion within the Technicians Guild. Peter chose the setting, usually with a whimsical touch, and, in some cases, autobiographical. These paintings were reproduced by Peter Robson Studios into limited edition prints and china plates and they were presented to the Technicians who successfully completed the examinations in that year, sometimes in the thousands. Peter was born in London, England in 1940 and he was evacuated with his little sister to Somerset, in the West Country, to escape the relentless bombing during the blitz of London in WW 2. After the war, his family moved to the seaside town of Margate in Kent, where Peter spent his childhood and adult years until he emigrated to Canada in 1966. The setting for this car is the boardwalk of Margate with the permanent fairground, Dreamland, in the background. This might seem a bit unusual, but during the war there was an American military base close to the town and after the war many men stayed on and had their beloved American cars transported over to England. Therefore, the '53 Corvette would have been seen by Peter (when he was thirteen) and left an indelible image in his mind. 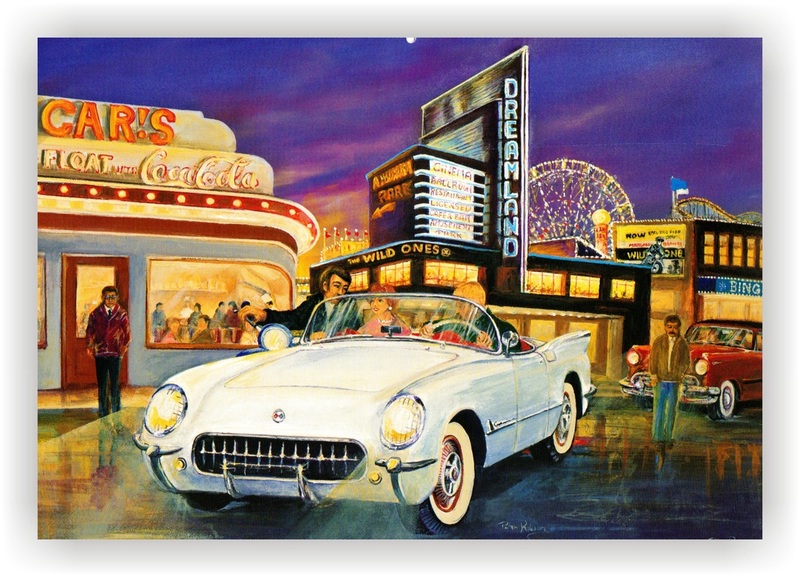 THE COMPLETE COLLECTION OF GENERAL MOTORS CLASSIC CAR PAINTINGS CAN BE SEEN IN THE 'OPEN EDITIONS' SECTION OF THE WEBSITE.